New product family: ZIMMER Manual Clamping Elements | DamenCNC B.V.
Manual Clamps for use with HIWIN linear rail and other manufacturers rail to lock carriages into a fixed position. 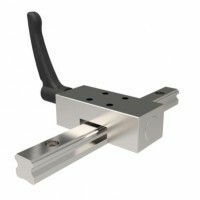 An economical way to manually stop the sliding motion of linear guides. Very simple yet robust design achieves highly effective manual clamping. HK manual clamping units are intended for STATIC holding only. Using them for dynamic braking is not recommended and could damage the linear rail. Adapter plate is required in some applications to elevate the height of the mechanism to equal that of the bearing/guide. Application examples are, length measuring systems, machine adjustments, Adjustment of width and stops, Positioning of optic instruments and measuring table, Table traverses and carriages. We have the HK series for HIWIN in stock in the most often sold size range. These elements can be used with other brands as well. On the ZIMMER group website, conversion tables can be found, on which clamp fits which brand.